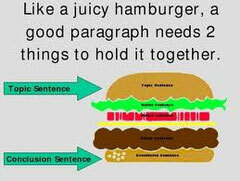 A paragraph is a collection of related sentences dealing with a single topic. Learning to write good paragraphs will help you as a writer stay on track during your drafting and revision stages. Good paragraphing also greatly assists your readers in following a piece of writing. You can have fantastic ideas, but if those ideas aren't presented in an organized fashion, you will lose your readers (and fail to achieve your goals in writing). The basic rule: The basic rule of thumb with paragraphing is to keep one idea to one paragraph. If you begin to transition into a new idea, it belongs in a new paragraph. There are some simple ways to tell if you are on the same topic or a new one. You can have one idea and several bits of supporting evidence within a single paragraph. You can also have several points in a single paragraph as long as they relate to the overall topic of the paragraph. If the single points start to get long, then perhaps elaborating on each of them and placing them in their own paragraphs is the route to go. Elements in aparagraph: To be as effective as possible, a paragraph should contain each of the following: Unity, Coherence, A Topic Sentence, and Adequate Development. As you will see, all of these traits overlap. Using and adapting them to your individual purposes will help you construct effective paragraphs.